The high and dirty water that we experienced 1 ½ weeks ago has come and gone. The rivers have come back to near-normal levels and the clarity is just about ideal right now – especially with this high sun and blue skies. The lack of rain is keeping the run of fish to a trickle, but the fish that are hooked are pulling on the line hard with the water temps stable in the low 40’s. While the fishing has been comfortable, we need some of that nasty steelhead weather to bring in some more fish and with some rain, April should be great. Most of the steelhead are either on or are staging near gravel. The fresh fish are still in the bigger, deeper holes resting as they migrate upstream so you should be able to find fish in all types of water. And with more anglers on the water lately, it’s nice to have confidence in finding fish throughout the river. The water directly below Tippy dam on the Manistee has the most spawning gravel in it and as such the bigger numbers of fish and anglers. The Betsie has fish throughout the upper sections too from US-31 up but timing is crucial on this river after any precipitation for optimal success. Boardman anglers have experienced a pretty good spring so far if you are looking to get out close to home if in TC. Flies that have been working well are mid-sized eggs in chartreuse and Oregon cheese and nymphs including steelie buggers, caddis, fry patterns, black stones and hares ears. The trout fishing is picking up as water temperatures increase. It’s a streamer bite fished slow with patterns that have lots of action on the pause. 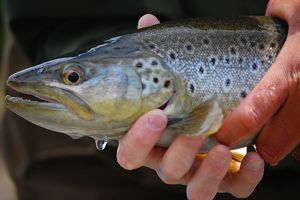 Fish are chasing a lot and nipping, so set the hook on the bite, not the sight – don’t pull the fly away from that big brown! Ted Kraimer is a professional guide and fly tier, owner of Current Works Guide Service, and field editor for True North Trout. 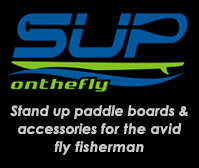 His fishing reports will continue to appear in T|N|T and on his website.